Since 1993 the Tutor/Mentor Connection has been maintaining a list of Chicago area non-school tutoring and/or mentoring organizations and sharing this information in an effort to help existing programs attract a more consistent flow of needed resources, while also helping leaders identify places where more programs are needed. In 2011 the Tutor/Mentor Institute, LLC was created to continue this service. You can find contact information for nearly 200 Chicago area youth serving programs by browsing the Chicago Program Links list. You can also use the map, shown below, to determine what groups operate in different parts of Chicago...or near where you live, work, or along the route you travel as you do to and from work every day. The program links list is also organized by sections of the city and suburbs, for the same purpose. This map can also be seen here. If you click on an icon you can find the organization's name and their web site. Copy and paste the web address into your browser and you can learn more about the program, depending on how well the web site communicates the program purpose, history and design. Below is a JPG showing what the map looks like when open opened. Some of the locations on this map are headquarters sites of organizations that offer community based mentoring (mentors meet with kids at different places), or are organizations with many different sites where they offer services. Big Brothers/Big Sisters of Metropolitan Chicago and Working in the Schools (WITS) are two who fit these descriptions. You'd need to go to their web sites to see their lists showing locations where they are active. This information can also be a starting point for others to get to know these organizations better, to help each of them attract needed resources, and to help share ideas across different programs so all will improve. 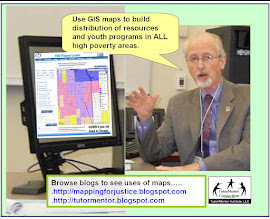 This map replaces an interactive Chicago Tutor/Mentor Program Locator developed by the Tutor/Mentor Connection between 2004 and 2009. Since 2013 I've not had funds or technology support to update the site and in August 2018 the link to Google maps stopped working. In this section and this section of the Tutor/Mentor Institute, LLC Planning Wiki you can read the history, goals and current status, for building a map-based tutor/mentor program database. Such a platform can be applied in any city to support the growth of needed services in all high poverty areas, thus volunteers, partners and financial support can come from any place to help this work become a reality. Until I'm able to get the original program locator working properly again, you can still use the Chicago programs list and map shown above to seek out existing programs where you can offer your support or try to enroll a student. I depend on contributions to maintain this list of programs, the Tutor/Mentor Connection web library, my blogs, etc. Please make a contribution so I can keep this information freely available to all. Visit this page to find an address and a PayPal button.